Star World 3 is the third Star World level in the game Super Mario World, which is accessible by the Star Road located to the south of Soda Lake and also via the secret exit of Star World 2. This level takes place in the sky and features a rare yellow-colored Baby Yoshi. 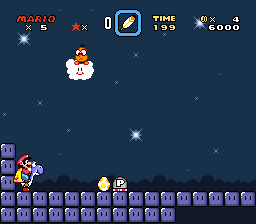 Star World 3 consists of one short screen, which the player has 200 seconds on the Timer to complete. It is made mostly out of Grab Blocks, and grabbing the wrong Grab Block could lead to losing a life. There is a Gray P Switch which can be used to change the Spinies the Lakitu throws at the player into Gray Coins, which can be collected to get many extra lives. Like all Star World levels, there are two ways to complete the level. Placed behind the Giant Gate are three Dragon Coins in Super Mario World: Super Mario Advance 2, which can be obtained by hitting Lakitu with a Grab Block (or a fireball if Fire Mario), taking his cloud, and going up into the opening in the middle and over the right wall, which will allow the player to go over and behind the Giant Gate. The Giant Gate is directly to the player's right at the start of the level. To find the Key and Keyhole, the player has to hit the Lakitu with a Grab Block (or a fireball if Fire Mario), then steal his Cloud. The player should use the cloud to float up through the opening in the Blocks in the middle, and then float to the left side. To get the Key, the player should hit the ? Block. After the Key has been obtained, the player should take it to the right side of the gap and put it in the Keyhole. Beating the level this way allows access to Star World 4. It is also possible to fly through the opening as Caped Mario. This page was last edited on April 9, 2019, at 03:07.